Subsumed by the Nascar juggernaut, Formula One barely registers on the radar of most American motorsport fans, lending wheel-to-open-wheel racing a dose of underground cachet. It is so underground, in fact, that one Michigan man channeled his love of Formula One into a veritable basement fight club. 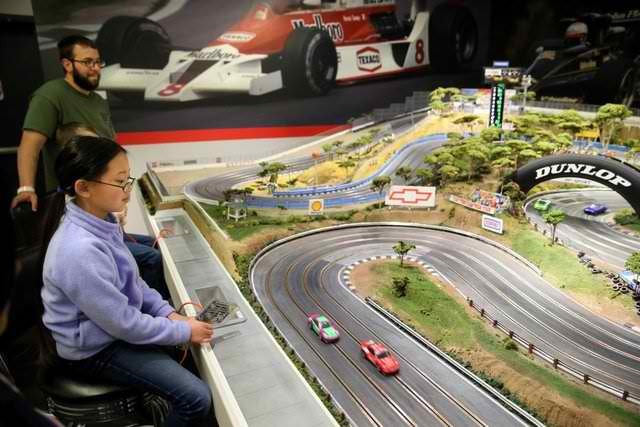 James Harlan, by his estimation, presides over the most elaborate slot-car racetrack in the country, which he built in his 1,000-square-foot basement and modeled after some of the Formula One race circuit’s most notoriously challenging track features. “I suppose I’ve taken it pretty far beyond what’s been done,” he said. 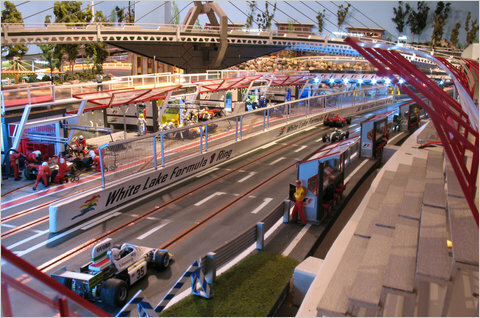 Named after his Michigan hometown, the White Lake Formula One Ring comprises left- and right-hand sweepers, S-curves, 20-foot straightaways and slots for up to four cars. The surrounding landscape is a snow globe of rocky terraces, skyscrapers, viewing towers, garages and tree-covered knolls. The Ultimate Formula One Slot-Car Track – NYTimes.com.